Their own children are grown, but Drs. Jeff and Ellen Kempf once again had a house full of toys and the crazy-but-wonderful chaos that comes from having little ones under roof. Jeff, a pediatric ER doctor and director of Akron Children’s Global Health Center, and Ellen, medical director of our Oak Adoptive Health Center, served as surrogate parents for two adorable, Creole-speaking boys from Haiti for five weeks. Both were diagnosed with congenital heart defects and, without surgery, would most likely not survive into adulthood. Sadly, such advanced care doesn’t exist in their impoverished country. Thanks to Akron Children’s and other benefactors, the boys – 17-month-old Kurtis Petion and 4-year-old Elie Pierre – were able to travel to Akron for their surgeries. Haitian government rules would not allow their parents to leave the country with them, but did allow Denso Gay, a 24-year-old St. Damien employee, to come as the boys’ interpreter and legal guardian. “Make sure he’s safe,” Kurtis’ father said through tears, as he handed his young son over to Jeff. 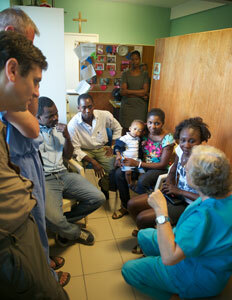 The roots of this life-saving trip started with the massive 2010 earthquake that devastated Haiti. The Kempfs organized several medical missions to St. Damien Hospital, Haiti’s only pediatric hospital, and soon a formal “sister hospital” relationship was forged between Akron Children’s and St. Damien. While volunteering there, Jeff helplessly watched as a 10-year-old girl with a congenital heart defect was sent home to die. This is something that could be easily fixed in the United States. “We saw kids who were dying of things that we never would let happen here,” said Ellen. The Kempfs then learned about Gift of Life North East Ohio Inc., which offered to pay $5,000 each for Kurtis’ and Elie’s surgeries, a fraction of the tens of thousands of dollars the hospital typically bills for such complex medical care. Out of many possible Haitian children, Dr. J.R. Bockoven, a pediatric cardiologist, identified Kurtis and Elie because their heart defects could be fixed with one surgery and didn’t require much follow up. Drs. Philip Smith and Michael Spector, Akron Children’s pediatric heart surgeons, repaired Kurtis’ ventricular septal defect – a hole in the heart – in a five-hour open heart surgery. Fixing Elie’s defect, known as a patent ductus arteriosus, proved to be more challenging due to his age. A PDA is much easier to correct in infancy when the hole is small. 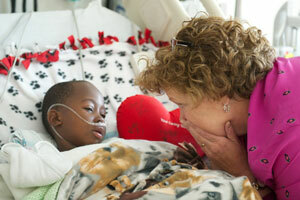 But with surgery and a follow-up procedure in the cath lab, cardiologists also repaired Elie’s heart. Just days after their surgeries, Kurtis and Elie were walking, taking wagon rides and playing with the Kempfs’ golden retriever. Read part one and part two of the Akron Beacon Journal series.